'He (or she, as with Indira Gandhi in 1977) must defeat himself,' says Shekhar Gupta. One week may or may not be a long time in politics, but a year can be. A political year, doesn't, however, necessarily follow the Gregorian rhythm, but one that is so schizophrenic that you mostly feel it once it has left you by. It also changes from year to year, and not necessarily every year. Let's simplify. There can be years at a stretch when our politics remains fundamentally static. The three years between mid-May 2014 and late 2017 were like that. These years could be a political commentator's nightmare if only the prime minister had not taken pains to light them up with demonetisation, etc. Until the winter of 2017, most analysts would have agreed on three things: That a second term for Narendra Damodardas Modi was a done deal; that Rahul Gandhi and his Congress were in terminal decline; and that, long after Indira Gandhi's heyday, India was headed for a long spell of one-party rule, and unipolarity. 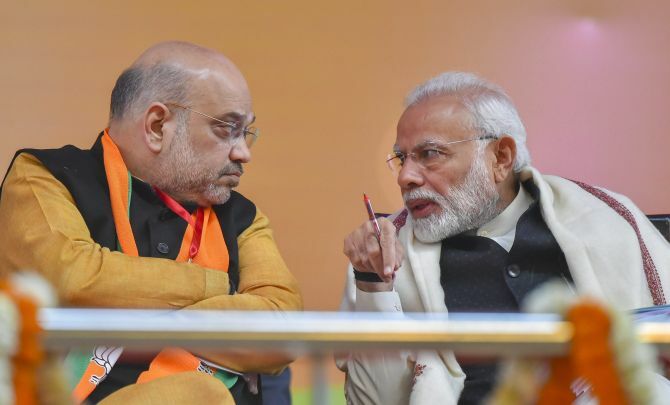 The big win of Uttar Pradesh had 21 states under the BJP's belt and pretty much set the tone for the rest of the state elections scheduled during the Modi government's term, and the big test in 2019. Something changed by mid-December 2017. Yes, the BJP won a remarkable sixth term in Gujarat, but the contest had been closer than anyone had anticipated. It was reflected in the anxiety that both Mr Modi and Amit Anilchandra Shah displayed in their campaign. The prime minister's tears -- in victory and relief -- at the BJP parliamentary party meeting shortly, thereafter, showed what a close call it had been. We had then written that this will bring about a fundamental shift in Modi-Shah politics. That they will no longer be plugging growth and jobs but a three-point proposition of Hindutva, hard nationalism with welfarism, and corruption-busting crusading. We can look back in satisfaction that we made the right call. It still wasn't the most important change and, to that extent, we failed to anticipate it. On December 18, 2017, not many would have said that Indian politics would lose its unipolarity in the next 12 months. That's exactly what has happened now. It was no empty boast. It was conventional wisdom that if the BJP fell short of the numbers anywhere, enough of the rest will automatically gravitate to it as the only pole to go to. Its successes in Goa and the smaller north eastern states, where it would form the government whether or not it was the largest party (Goa, Manipur) or in a minority of two (Meghalaya), had shown that the numbers no longer mattered to it as there was no competition. Many of these north eastern BJP governments, therefore, were more like leveraged buyouts. That is the leverage, Ram Madhav suggested, Mr Shah personified. It changed first with Karnataka. 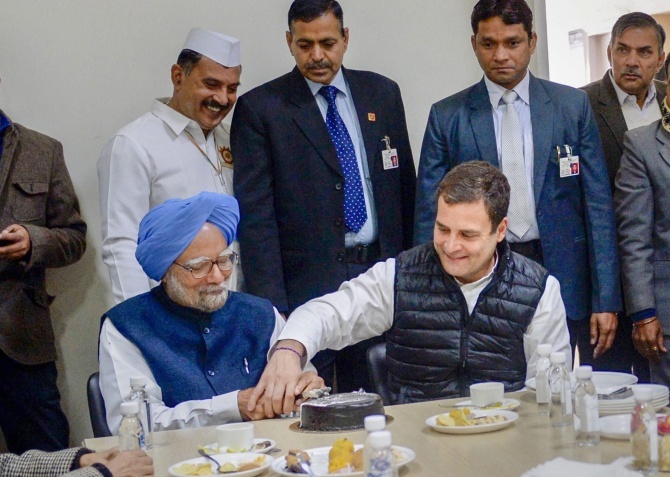 While the Congress surprised its friend and foe by going against its power instinct to cede chief ministership to a smaller ally, the seeds of a new politics were planted: A growing alliance of all those who were so desperate to keep the BJP out, and they would pay any price for it now. This challenged Amit Shah style politics. His power, of course, came from resources, and that much-used word these days -- 'agencies'. At some point in the battle for Karnataka, the BJP's rivals lost their lure for immediate largesse and fear of the agencies. The BJP's inability to win despite bending every law and morality by getting the CBI to let off the Bellary brothers months before that election was a political setback of lasting implications. Mr Modi's inability to swing a decisive win despite anti-incumbency and humongous spends, Bellary mafia power, combined with that formidable show of autonomy by the Supreme Court, which sat overnight to prevent a hijack in Bengaluru, had taken away the aura of invincibility from Mr Modi. First of all, Karnataka proved that Mr Modi and Mr Shah were no unbeatable geniuses, and the Congress still had the guile to defeat them strategically. Further, Mr Modi had failed to win an election where he was the favourite, the powers of resources and agencies had failed to win over MLAs, and institutions, notably the Supreme Court, were defying him. A footnote: This had happened about a year after the first institutional setback to the Modi-Shah BJP, at the Election Commission, over Ahmed Patel's Rajya Sabha election in Gujarat. It was now becoming clear that you could take the power of the BJP on, and hope to not just survive, but even win. It set up a different tone for the coming Hindi heartland elections. The party and its allies could now believe that Mr Modi was beatable, something they wouldn't have dreamed of before mid-December 2017. By mid-December 2018, they believed for the first time that power was within their reach. That is why we call December to December 2017-2018 as a most important political year. The afternoon the Madhya Pradesh-Rajasthan-Chhattisgarh results came, we had said that Mr Modi's idea of creating a Congress-mukt India was over. He also acknowledged it indirectly in his now doubly famous interview to ANI's Smita Prakash by saying that his idea of a 'Congress-mukt' India wasn't that the party was demolished and buried, but where its ideology and thought ceased to exist. Then he defined his idea of that Congress thought: Casteism, dynastic politics, undemocratic and nepotism. Now, with the rise of Rahul Gandhi, a caste-based parties's alliance (SP-BSP) threatening the BJP in Uttar Pradesh and the Congress counter-attacking him with corruption charges, even if his definition of the Congress as a thought is correct, it is now back, much stronger than it was at any time after 2010. This is the second pole Indian politics was missing for at least three years. You will have to be nuts to say that Mr Modi is now an underdog for 2019. His personal popularity, connect with his audiences and magnetism are largely intact. As we have said before, in India a strong leader with a majority has never yet been defeated by a challenger. He (or she, as with Indira Gandhi in 1977) must defeat himself. For that three things must happen: One, that he should become so unpopular that people will vote against him, no matter who might come to power in his place. Two, that a critical mass of diverse political forces should detest him so much that they will sink their differences and ambitions and come together against him, fear being the glue. And three, that there must be someone, some force for them to gather around, not necessarily a likely prime minister. In 1977, against Indira Gandhi Jayaprakash Narayan played that role, and in 1989 against Rajiv Gandhi, it was V P Singh. From being a bumbling, fading dynast a year ago, Rahul Gandhi has led his Congress into that -- second pole position. The game for 2019 is now on -- the reason the prime minister chose to miss Parliament and launched his campaign. With quota politics is Modi playing V P Singh v2.0?